WWI Profile: Rufus Earl Sellers 1899-1946 | Friends of Fort Caswell Rifle Range, Inc.
Postcard of the Boys Brigade Armory in Wilmington, 1908. Rufus Earl Sellers was born and raised in Brunswick County, NC. A partial family tree is located in FamilySearch. Rufus had two brothers who also served in WWI, Pvt Oscar David Sellers and Mechanic Chesley Burgwyn Sellers. Rufus’ NC WWI Service Card shows that he enlisted in the NC National Guard on May 7, 1917. He was 18 years old. He actually was a member of a group of young men who answered the call of Boys’ Brigade, which was then accepted into the NC National Guard. The story behind this is an interesting one. The Boys’ Brigade was a national organization that gained popularity in the 1890’s. It was similar to Boy Scouts, with a civic and military focus. In 1895, Colonel Walker Taylor, a prominent businessman in Wilmington and regional commander in the state militia, organized a local group that was admitted to the United Boy’s Brigades of America as Company A, First North Carolina Regiment, the first company of its kind ever organized in the state. Col. Taylor supplied muskets and bayonets. There were uniforms consisting of white pants, shoes, caps and blue jerseys. There were annual encampments and drilling at the State Guard. Members were required to attend a Sunday School of their choice and regular drills with the brigade. 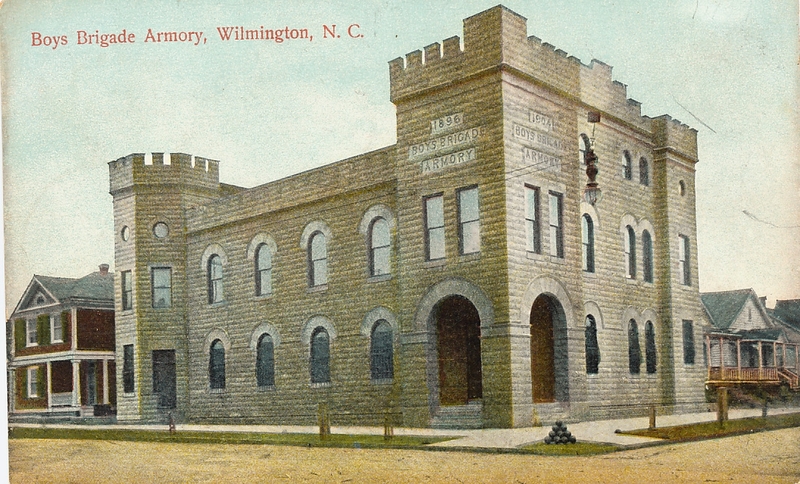 In 1903, Col. Taylor bought a house at Second and Church streets in Wilmington and an armory was constructed for Brigade members. The photo is shown above. The building included an auditorium, dining room, kitchen, gymnasium, dressing rooms, a bowling alley and a 2,000-volume library. Membership swelled to nearly 500 boys. Sports, clubs, vocational classes and more were added. The Boys’ Brigade was disbanded in 1916, then later became part of the Boys and Girls Clubs of America and still exists today. The armory was used for various military functions during the early part of the war such as troop quarters for North Carolina Cavalry and the Field Artillery infirmary. Near the later part of 1918, Carolina Shipbuilding Corporation leased it for employees. The building eventually fell into disrepair and was demolished in 1962. On May 18, 1917, six weeks after the United States formally entered the war, the U.S. Congress passed the Selective Service Act giving the president the power to draft soldiers. The first draft, June 5, 1917, was required for men between the ages of 21 and 31. Likely anticipating the draft and age ranges, the former Boys’ Brigade leaders must have realized that younger men would have an interest in serving. These former leaders organized meetings in Wilmington. On March 29, 1917, a call was made to former members to organize an infantry company. It was their hope that the NC National Guard would accept this infantry once assembled. At an April 2 meeting, Col. Walker Taylor told the young men that they should answer their country’s call, saying that it would be much more pleasant to serve with friends than with utter strangers. On May 16, 1917, the list of recruits was published, which included the following young Brunswick County men. Wanted were those between 18 and 30 years of age, who weigh at least 120 pounds and stand at least 5’4″. Training was planned at Camp Royster in Goldsboro, NC. The Boys’ Brigade was soon accepted into the NC National Guard and Rufus was eventually assigned to Company I, 119th Infantry, 30th “Old Hickory” Division. Except for James R. Potter, all from the Boys’ Brigade listed above served in the 119th Infantry. Previous posts described training with the 30th Division at Camp Sevier, SC, the transportation to France, and events up to and including the Hindenburg Line assault. Cpl Rufus Sellers was described as “slightly wounded” and returned to duty October 17, 1918. The war had less than a month to go. After Cpl Rufus Sellers was discharged, he married and raised a family. He passed away on June 23, 1946, at age 46. His obituary was published on the front page of the State Port Pilot [June 26, 1946]. Note that his age was misprinted. See his family tree referenced above for documents verifying he was 46. Rufus Earl Sellers, 61, for many years employed as engineer by the U.S. Army Engineers Office in Wilmington, died in the Veterans Hospital in Fayetteville Sunday. He had been in failing health for some time. Mr. Sellers is survived by his widow, Mrs. Opie Sellers; three sons and one daughter, Burwin Sellers, John Paul Sellers, Earl Lee Sellers, and Miss Cellie Sellers, all of Supply. In addition three brothers and two sisters survive. They are Willie Sellers of New York, Charlie and Oscar Sellers, of Supply, Mrs. Homer Peterson, of Wilmington, and Mrs. Annie Belle Fullwood, of Supply. The remains were brought back to Brunswick by Kilpatrick’s Funeral Home and burial was made at the Galloway cemetery near Supply yesterday afternoon at three o’clock. Rev. Mr. Fulmer, pastor of Mt. Pisgah Baptist church, had charge of the funeral services. The active pallbearers were Murdic Holden, J.R. Lawrence, Floyd Evans, Murchison Holden, Dewey Sellers, and J.B. Sermons. Honorary pallbearers were Dr. J.W. Hayes, Dr. L.C. Fergus, Dr. L.G. Brown, Floyd Kirby, Herbert Sellers, Yates Sellers, Herbert Holden, E.L. Holden, Hiram Long, Elwood Clemmons, O.P. Holden, and T.T. Clemmons. Rufus Earl Sellers was laid to rest in Supply. No military honors are shown. The information on Boys’ Brigade was gathered from the following sources. Dudley, First Lieutenant E.P. “The Boy’s Brigade.” The Wilmington Morning Star, 18 Jul 1897, p. 1. “Boys Brigade Members are Ordered Out.” Wilmington Dispatch, 29 Mar 1917, p 5. “Boys Brigade in Line.” Wilmington Morning Star, 03 Apr 1917, p. 5. “Boys Brigade Unit.” The Wilmington Morning Star 19 May 1917, p. 5. Star News (Wilmington, NC) Ask a Reporter of Feb. 2011.